Blue Ribbon helps customers improve their comfort, decrease electricity consumption and reduce harmful emissions with advanced central air conditioning systems. Unlike many installers, we adhere to the manufacturers' specifications, so your system achieves optimal performance. We use advanced diagnostics to ensure that cooling is balanced from room to room. cooling equipment please contact us below. 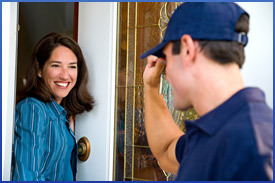 Blue Ribbon provides complete maintenance services for central air conditioning systems. Our annual inspection and tune-up service provides essential preventive maintenance to guard against breakdowns and restore the system to optimal efficiency. If your system ever breaks down, our experts will diagnose and repair the problem without delay. Blue Ribbon keeps our customers' cooling systems running smoothly and efficiently with expert inspections and tune-ups. We start by inspecting the system components and repairing any small problems that we uncover. We clean the evaporator and condenser coils as needed and adjust the refrigerant charge, if necessary. We also oil the motor and check the filters. If we find any minor problems, we fix them, which helps prevent major problems and costly repairs. To schedule an air conditioning tune-up, call us today at (973) 667-7988 or contact us online.